I love Star Trek, in all its forms (well, except Enterprise, which I just kind of like but don't tend to watch). I've proudly self-identified as a Trekkie (not Trekker - if you know the difference, you're a Trekkie by default) for years and have even been to a convention and everything. My absolute favourite Star Trek series is Voyager. I will not be moved on this and I will politely ignore any attempts to persuade me that Voyager is anything other than fabulous! Even 'Threshold', which I believe has beaten 'Spock's Brain' to the title of Worst Episode of Star Trek Ever, is absolutely hilarious as long as you don't take it seriously. This is generally the key to enjoying Voyager and, indeed, all Star Trek - don't take it seriously. Except when it's being serious. I also love the Original/Classic/Whatever series and especially the films, which made me fall in love with Star Trek in the first place. The Next Generation was fondly watched when I was younger and although I don't always remember it too well, I love it. I haven't seen so much Deep Space Nine, but it gave us the fantastic anniversary episode 'Trials and Tribbleations', for which we must be eternally grateful. 2.02 Who Mourns for Adonais? I review Star Trek Voyager for Billie Doux - index page here. 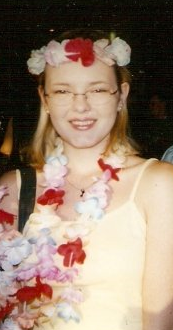 Me at the Star Trek: Voyager convention, dressed up for the Holodeck-themed party on the left (I nicked the lei from Hawaiian Night at work, where we had to waitress in them, and just threw on some summer clothes!) and wearing a tiny comm badge on the right, so small it's invisible to the naked eye. This was way back in 2001; I'm not quite so fresh-faced any more. Robbie McNeil made my year by putting kisses on the signed photo I got of me and him, for which I will love him forever.